Most people meal prep Monday-Friday. But, what about the weekend? Having some healthy goodies in the fridge on Friday/Saturday/Sunday will curb those cravings for the more indulgent things.. because you know you'll end up having those later anyway. The Tarragon Vinaigrette is what really makes this salad shine. 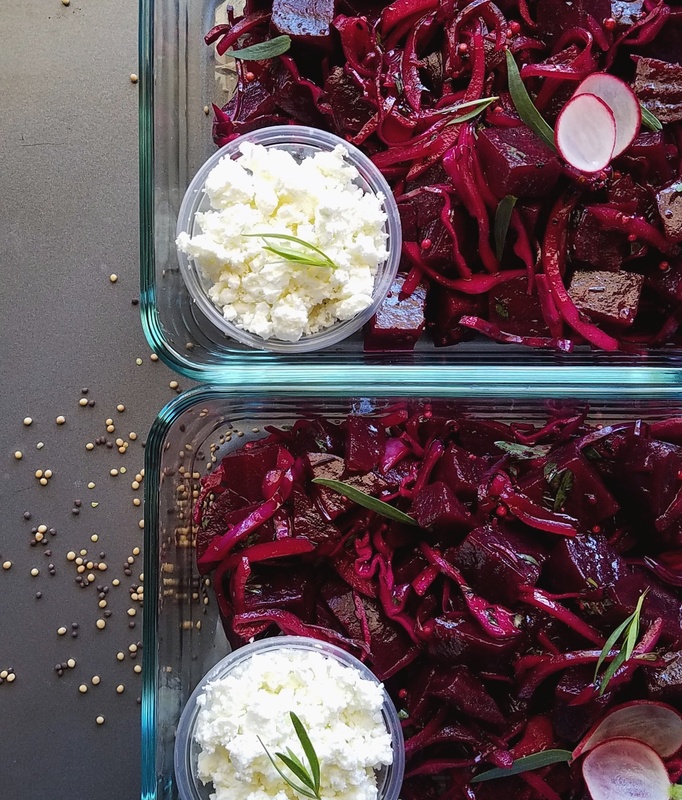 It marinates the roasted beets, shaved cabbage, and red onion, so every ingredient sings together. You can totally make this ahead for the week or weekend. It's amazing right out of the fridge. And, it's already dressed. Preheat oven to 375. Clean beets, and wrpa indivudally in aluminum foil. Plcae wrapped beets onto a cookie sheet or sheet tray. Roast on middle rack of oven for 1 hour, or until beets are toothpick tender. Remove beets from oven, and remove foil. Use caution as beets will be hot and release steam. Allow to cool to room temperature. Peel beets, then dice into 1/4-1/2 inch cubes, or desired size. Place beets in a large mixing bowl. Then add shaved cabbage, onion, and tarragon to beets. Hold in fridge while you make the vinaigrette. Now to make the vinaigrette. Place all ingredients for vinaigrette in a mason jar, cover tightly with with lid. Shake the jar until agave nectar is dissolved. Pour dressing over roasted beets/cabbage mixture and toss with a large spoon or spatula to combine. Taste salad, and season with salt and pepper as necessary. Allow salad to marinate for at least 15 minutes. Salad will keep in fridge for up to 4 days. Finish salad with crumbled goat cheese and fresh tarragon.